Up till now, Dave Madigan's luck was all bad -- but that can change with one successful drive across the open range. He's got a contract with the army to round up fifty head of horses and deliver them to Fort Peterson, a hundred miles away. But he's also got an enemy -- a faceless rider who's been rustling his herd and shooting up his cabin. And in Clarion, where justice is cruel, swift, and often wrong, the townsfolk are itching to hang an innocent Mexican for the crimes. 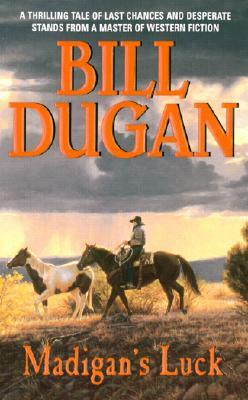 Now Madigan, who's always walked a solitary path, has to wear a deputy's badge to save his ranch and a life. But Dave Madigan knows that luck may play a larger part than law and his whole future may hang on a single shot in the dark.